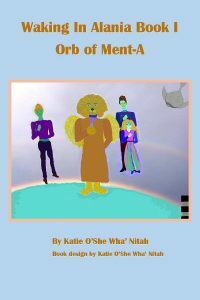 Kara, Eshwa, Caldor, and Ganedo would LUV to invite you to a Weekly Book Reading on Facebook Live of their book “Waking In Alania Book I: Orb of Ment-A” read by Katie O’She Wha’ Nitah every Wednesday at 7 pm – 8 pm starting on August 1st, 2018 until the book is finished. Question and answer session after the reading and please bring your own refreshments. For those who would like to follow along with their own book please follow the link below to purchase the PDF for $2.99 or the Paperback for $12.12. For those who have not heard of the book please follow the link below for details. ***Also just a quick reminder for those who have read the book and those interested to register to become a Member of Alignment In Spirit to post your Reviews of the Book, comment on Posts and set up Your Own Profile Page. Please forward this invite to all you think would enjoy this reading. No one in their innate nature is in servitude to another. It is never OK to force a people to ever be designated as less than another for Any Reason What So Ever. Where did the word Slave come from? There has been recent discussions among some very awakened Moors of America, who know they are not black and know that they did not come from somewhere else. They are indigenous to the Americas and struggle and fight everyday do educate their people to wake up and be their authentic Self and not be a Slave to being a commodity in the defacto Corporate US Stockmarket. A corporate state where currently people are identified under Color of Law as Corporate Colored Persons such as white, black, yellow and red persons. We all are not crayons and there is only one Race the Human Race divided up into Nations. Please check out Waking in Alania and The New SEPA Handbook reduced prices in Taking New Thought to the Next Logical Step. While each book had its own strong message and needed at first to be promoted on their own accord. The times have changed and the 2 books are now harmonized into one unified combo in taking New Thought to the Next Logical Step for the price of one. Also, do not forget to check out our Harmonizing Sessions to delve deeper into your own Inner Being through guided meditation and or individualized support. 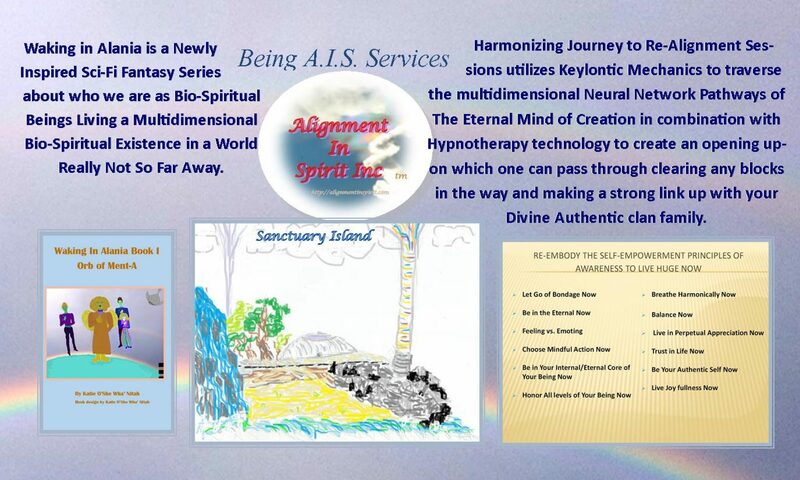 Now Register to become a member of Alignment In Spirit and its branches Being A.I.S. Publications and Moorish Alignment In Spirit. Check out Waking in Alania’s New Front Cover plus People Can Now become Members Taking New Thought to The Next Logical Step! Yes, I finally finished the portrait of the Main Characters from Waking In Alania Book I: Orb of Ment-A. Ganado, the ancient winged Lion of the special guardian of the Universal forces stands strong in the center with Prince Caldor of Picalo to his right and Kara, of the House of Yenta and Eshwa, Prince Caldor’s second in Command, to his left as the Orb of Ment-A rises beneath them. 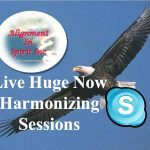 Also, I am exited to announce that people can register to become members of Alignment In Spirit. Now you can create a profile and comment on posts. I look forward to all the feedback and discussions that will occur as we take New Thought to The Next Logical Step. The register tab is located at the top left-hand corner of the website page. Our literature puts the attention on each person being the individuus of The All One as opposed to being a part of or a child of The All One. Both ideologies discuss life coming from The All One but if you do not make the psychological difference between being IT versus being a part of IT you are still falling into the trap of seeing yourself trying to gain the favor of something outside yourself. Something you have to work to be Worthy of. 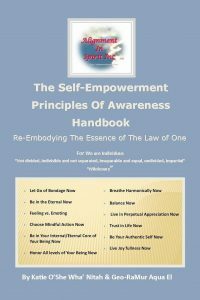 To those of you who follow Seth, Abraham Hicks, I am Ra: Law of One material and Keylontic Science will very much like to add these books to your collection in your desire to expand and Evolve as a Bio-Spiritual Being on The Earth Plane of Existence. Seeing yourself as IT or “The All” can be initially pretty mind-blowing. We have been taught from a young age to see ourselves as less than so for many people to make that leap can be difficult. Being A.I.S. 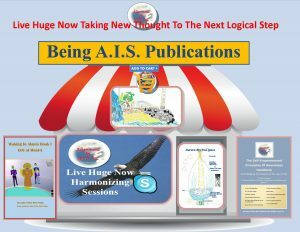 Publications introduces Harmonizing Sessions for those that would like a private session in the shifting process. 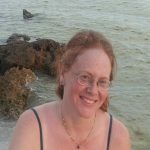 These sessions utilize ancient Keylontic Technology (Recently brought back by E’Ashayana Arhayas/Dean) and Katie O’She Wha’ Nitah’s (Inner Clan) guidance for a unique LUVing experience with Your Inner Being. Please follow these links to explore our Literature and Harmonizing Sessions.